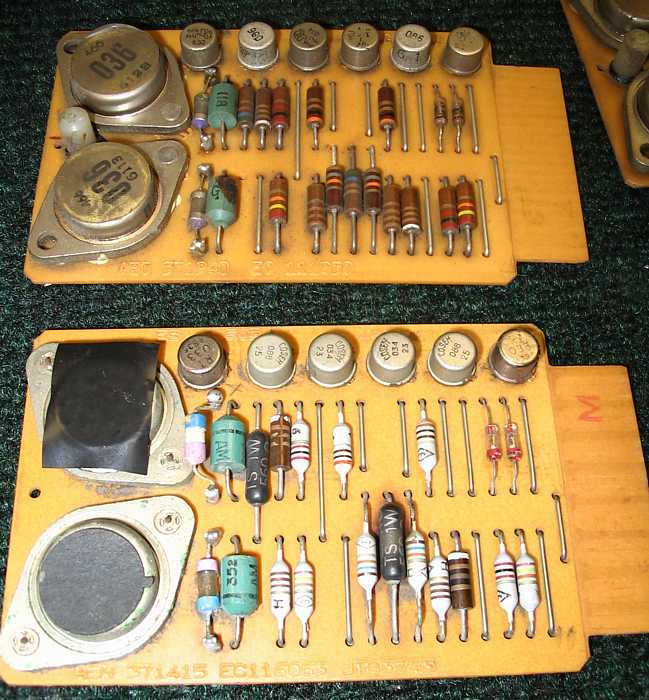 The next IBM format was for a "hybrid" circuit family for the IBM 360 series computers which started shipping in 1965. People at CHM wish to inventory, repair, use, ... these cards in at least two restored IBM computers, the IBM 1620 and the IBM 1401. Even different revisions and features of the IBM 1401 use different SMS cards. As an example, the printer hammer drivers used in the Visible Storage 1401 have a different name ("AEC") and circuit layout, but interchangeable with, the printer hammer driver cards in the restored 1401 ("AEN"). which affect possibilities for marking and tagging. Hammer driver cards Hammer driver cards represent rather "well stuffed" SMS cards. Note there is very little room for the card type, and number indicating other manufacturing information. Note that there is no unique number identifying and individual SMS card. Card type "AEC" near the lower left corner of the top card, "AEN" on the lower card. "We" are somewhat sympathetic to the idea of identifying each card for repair history, and possibly other reasons. "We" don't think tagging the cards with the string & cardboard type tag is a good idea as the loose tag is at high risk to interfere with the forced air circulation. As of May 19, 2006, "we" have not agreed on a scheme to uniquely identify each SMS card.